Barnett-Lewis Funeral Home 901 S. Minnesota Ave. Sioux Falls, SD 57104 P (605) 336-0707 F (605) 336-0708 Please run obit Tuesday, October 21, 2008: Picture is attached A Mass of Christian Burial for Bob Thury of Sioux Falls will be held Thursday, October 23, 10:30 am at Sacred Heart Catholic Church in Parkston followed by inurnment at Sacred Heart Cemetery in Parkston with direction from David Lewis of the Barnett-Lewis Funeral Home of Sioux Falls. Officiating will be Reverend Gerald Thury (uncle) of St Leo's Catholic Church of Tyndall . Serving as urn bearer will be Cindy Jordahl. Honorary bearers: Lance Thury, Jason Nelson, Josh Sammons, Cody Wilson, Neal Bainbridge and Gerry Quinn. Music will be provided by organist Mrs. Bonna McGregor. Bob was born January 25, 1945 to the late William and Relitta (Hoff) Thury at St Benedict Hospital in Parkston. 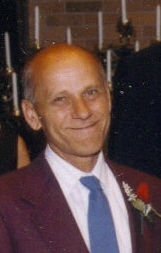 He attended Sacred Heart grade school and graduated from Parkston High School in 1963. He was a veteran of the Vietnam War having served in the Marines. He died Friday, October 17, 2008 at the Veterans Hospital in Sioux Falls after a lengthy illness. Surviving are his two brothers, Charles of Omaha and Larry (Dianne) Thury of Parkston; his sister-in-law Sandy (Milt) Nelson of Mitchell; 2 nephews; Lance Thury (Leslie Mechtenberg) of Parkston and Jason (Tiffany) Nelson of Rapid City; 3 nieces; Nicole (Josh) Sammons of Windom, Minn, Jenny (Cody) Wilson of Lenox and Tara (Neal Bainbridge) Thury of Parkston; 1 great nephew and 3 great nieces; Uncles, Clarence, Father Gerald and Joel Thury, Norman and Sam Hoff; aunts, Betty Fergen, Joan Fideler, Jean Severin, Karen Stein and Edna Heisinger; many cousins and family friend, Laverne Haynes. In addition to his parents, he was preceded in death by his brother, Allen; grandparents, Paul and Mary Thury, Henry and Lydia Hoff; uncles, Louis, James, Leonard, Don and Fred Thury, Eugene, Tape, Ervin, Ray and Dr. Helmuth Hoff; aunts Dolores Eisenbraun, Viola Herr and Emma Winkler. Visitation will be Wednesday, October 22, 5 PM at Barnett-Lewis Funeral Home with family present from 6-8 PM with a Scripture Vigil at 7 PM. An on-line registry is available at barnett-lewisfuneralhome.com.